Are you looking for a fun new workout to try in Delray Beach? If so, then you have to check out The Barre Studio located in Downtown Delray Beach! The Barre Studio offers two types of classes: Barre and TRX/Tabata, both of which are guaranteed to give you that fit body you’ve been dreaming of. The Barre class is a fun fusion of ballet, pilates, and yoga. This no impact workout enables you to use your own bodyweight for resistance, giving you those long and lean ballerina muscles. The TRX/Tabata Bootcamp class is 45 minutes and uses high intensity interval training to help you shed those unwanted pounds and sculpt a strong body. The HIIT is combined with the TRX suspension training to create a workout that will always keep you guessing; plateauing will be a thing of the past! Both workouts offer small class sizes to ensure that each person receives individual attention. Everyone wants a safe and effective workout and the committed teachers at The Barre Studio won’t fail to disappoint. Stop in and sign up for a class today; the studio is open 7 days a week, offering you plenty of variety! Also, check out what the owner, Kim Palacio, has to say about The Barre Studio below. 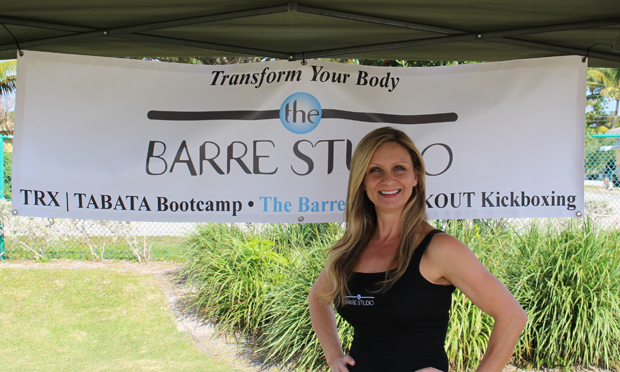 We loved getting to chat with her at the Delray Beach Fit Day! You can also take a peek at their website and Facebook page below!